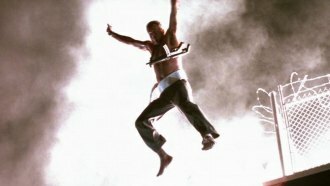 Home » Entertainment » Is "Die Hard " a Christmas movie? The Christmas film rotation is complete for another year. "It's a Wonderful Life," "White Christmas," "Miracle on 34th Street," "The Bishop's Wife," even "Going my Way," "Boy's Town," and "Bells of St. Mary's." not to forget "king of Kings" and "Greatest Story Ever Told." But Bruce Willis "Die Hard" has edged into the rotation in an ironic way ---- though release in the summer, the entire film occurs during an office Christmas Party overwhelmed by terrorists. It's star, Bruce Willis, said NO. But , in 1988 , when producer Joel Silver arrived on the set and saw all the Christmas decorations, he proclaimed , "This movie is going to roar into syndication and get played on television at Christmastime for years." Popping the bloody action thriller into the mix has become a tradition. Some even draw Willis in a Santa Hat. You have a chance on New Year's Day to catch it on marquee's big screen. Know what? The sequel takes place on Christmas Eve.